Melissa Etheridge kicks off PINKTOBER 2011 in "STAR" Style! Melissa Etheridge kicked off the 2011 PINKTOBER program at the Hard Rock Cafe on Hollywood Blvd with a very special celebration. Melissa received her "STAR" on the Hollywood Walk of Fame (located at the front entrance of the Hard Rock! ), and celebratated inside with family, friends and fans to help launch Hard Rock's worldwide PINKTOBER program, in support of Breast Cancer research and awareness. Fans were treated to an impromptu appearance of Melissa on stage for a duet of "I'm The Only One", a special Q&A to answer fan questions and a surprise autographed guitar giveaway to one lucky fan in the audience. PLEASE JOIN US TO CONGRATULATE PINKTOBER "ARTIST AMBASSADOR" MELISSA ETHERIDGE ON YOUR WELL DESERVED STAR ON THE HOLLYWOOD WALK OF FAME! 09.26: On this day in 2003, Robert Palmer died of a heart attack in Paris. Singer of such '80s iconic standards as "Addicted to Love" and "Simply Irresistible," Palmer enjoyed success in the '70s, '80's, & '90s, a veritable elder statesman in the world of pop and rock. Yeah, that video, you know the one, with the awesomely awesome guitar-weilding and drum-playing babes in tight black dresses and the brightest red lipstick, still has it. 09.27: On this day in 1947, Marvin Lee Aday was born. He would later go on to receive recognition as Meatloaf, a man who would do anything for love. Except, of course, that. Whatever that is. We've speculated over the years as to what that is. Could it be eating live bats like Ozzy? Or perhaps taking a role in a rock 'n' roll musical? Or wearing polyester? Or saying "Bloody Mary" three times in front of a mirror in a dark room? The options are endless. The VH1 Save The Music Foundation celebrates back-to-school with the announcement of grants to restore 50 school music programs! Each school district receiving instruments has committed to fund a certified music teacher to instruct the program, include music as a core subject in their curriculum and to build upon the grant, all fundamental parts of the Foundation’s mission. The VH1 Save The Music Foundation will be restoring programs in Birmingham, Boston, Chicago, Cincinnati, Denver, San Felipe Del Rio, Durham, Burbank, Houston, Jersey City, Memphis, Nashville, New Haven, New York City, Philadelphia, Roanoke, San Diego, D.C., West Virginia, and various other communities across the US, helping to ensure that no child be deprived of the opportunity to receive the benefits of music education. Hard Rock "Ambassadors" from the Hard Rock Hotel & Casino in Punta Cana visited The Orfanato Ninos de Cristo Program in La Romana, Dominican Republic, part of The Orphaned Starfish Foundation. Orfanato Niños De Cristo was founded ten years ago with a mission to provide a safe home, family, and education to these children and to prepare them for adulthood. To learn more about The Orphaned Starfish Foundation click here. TAKE TIME TO BE KIND. The Ninos de la Amazonia project provides educational scholarships to children in villages in the Amazon so they can serve their communities in the future. Hard Rock International was present to support the Ninos de la Amazonia, and Sting and Trudie Styler's Rainforest FUND at their annual event in NYC. For more on how you can help click here. ALL IS ONE. Please take a moment and think, act, do "Peace & Love" in honor of the UN's 30th International Day of Peace. Hard Rock was fortunate to join the Native American Communications Commission at the First Ladies Fashion Luncheon at the South South Awards Gala in New York, to coincide with the 65th session of the United Nations, in support of Fashion 4 Development. Fashion 4 Development is a global campaign that seeks to combat the United Nation's wider issues - from poverty to gender inequality, through key fashion initiatives and programs around the Globe. ALL IS ONE. Annie Balliro, Hard Rock Intl Sr Director Brand Philanthropy, Evie Evangelou, Fashion 4 Development and World Fashion Development Programme co-founder, Geri Benoit, Permanent Representative of Haiti to the UN Agencies in Rome, John Danner, Native American Communications Commission. Hard Rock partner, City of Joy, A rescue, rehabilitation and development action to imporove the life of the underprivileged children of Kolkata and rural Bengal in India, and collaborative partner for the "IMAGINE THERE'S NO HUNGER" Campaign, was part of the region affected by today's earthquake. To support the City of Joy click here. ALL IS ONE. With our executive chef Jason Gronlund leading the team, Hard Rock Cafe Lake Tahoe recently took home two gold medals from the Lake Tahoe Wine & Food Festival! The Cafe and Chef Gronlund took both the Judge's Choice and People's Choice awards for Best Pairing - Food & Beverage. They won with a BBQ Bahn Mi sandwich. Believe us when we say it is awesome! And you never know, you may see it on a Hard Rock menu someday. Congrats to HRC Lake Tahoe and Chef Gronlund! 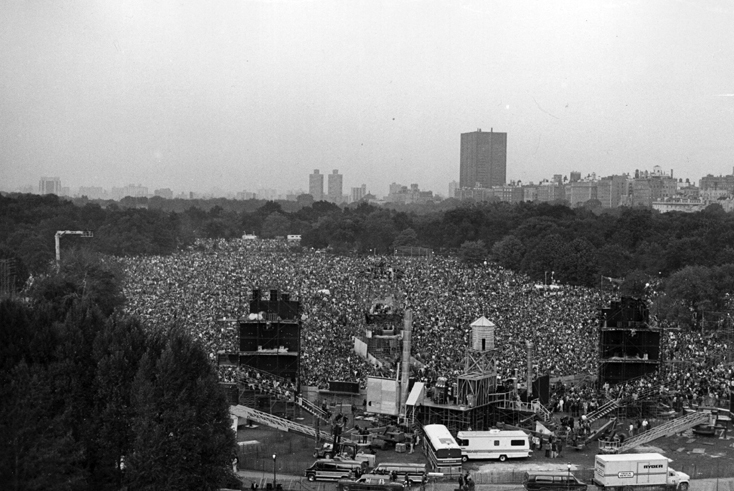 09.19: On this day in 1981, Simon and Garfunkel reunited for a concert in New York’s Central Park. It was their first appearance together on stage in 11 years. Just in case you weren't there, don't remember, or have no clue as to exactly how popular these guys were, 750,000 people attended this concert. Three quarters of a million people! Listening to "Mrs. Robinson," "Slip Slidin' Away," and "The Sounds of Silence"! What a strange, strange world we do inhabit. 09.20: On this day in 1973, Jim Croce died in a plane crash, another young casualty on the road of fallen musicians. Croce's working man storyteller style hit a chord in the early '70s, along with his smooth, honest voice, driving "Bad Bad Leroy Brown" and, posthumously, "Time In A Bottle" to the top of the charts.